If a payment has been made against an order in ekmPowershop it can be downloaded into Brightpearl. This requires the sales receipt creation to be activated from within the ecommerce connector. 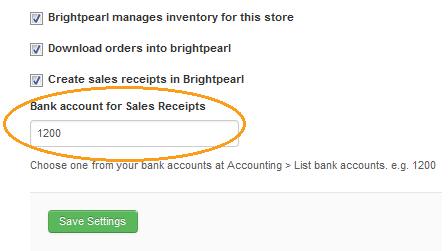 Activating the sales receipt creation means that an order placed and paid for on ekmPowershop will automatically download into Brightpearl as paid; the order displays as paid and a sales receipt accounting journal will have been created. Orders will be marked as paid where the payment was authorized and captured or was just authorized. Since payments captured later can't be downloaded the integration will process a payment when the order is downloaded. Note : Custom payment methods cannot be downloaded. If an order is placed with a custom payment method such as "Cash on Delivery" or "On Account", no sales receipt will be created. These will need to be processed directly within Brightpearl by allocating a payment against the order. The bank account into which the sales receipt is made is chosen when you set up the connector, and can be changed on the connector settings screen. A separate bank account can be used for PayPal payments but all other payment methods are made into the same bank account, so if you have a combination of payment methods on your ekmPowershop account you will need to make bank transfers into the relevant account. If you mark an order as “payment received” in ekmPowershop after the order has been downloaded into Brightpearl, the sales receipt will also need to be created manually in Brightpearl by allocating payment. When orders are shipped at the end of the day, you will need to go into ekmPowershop and find all “fulfilled but not paid” orders, and use the ekmPowershop batch process to capture payment. If you set your ekmPowershop account up to automatically capture payments during checkout, you won’t need to do this. Note that these payments are downloaded into Brightpearl when the order is placed. PayPal needs to be added to ekmPowershop as a payment method. PayPal payments will automatically download into Brightpearl along with the order from ekmPowershop. PayPal can also be integrated directly with Brightpearl. If you have also connected PayPal to Brightpearl you will see the same transactions appearing on the PayPal Log report. These transactions should NOT be created via the PayPal log as this will duplicate the accounting and over pay the order. To keep a record of the PayPal transaction on the order you can enter the txn ID from the PayPal log in the order notes and payment history. First of all make a note of your bank account nominal code in Brightpearl. Find it at Accounting > List bank accounts . Log into the ecommerce connector. Go to App Store , and click the Setup button for the relevant integration. 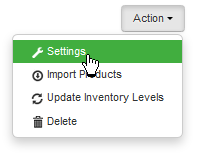 Click the Actions button next to the relevant sales channel and select Settings . Enter your bank account nominal code from Brightpearl into the field provided.